This posh patio bordered with and filled with gravel is moderately challenging to build, but easy to maintain and a snap to change to a different kind of fill stone. A sturdy gravel patio should be at least 4" thick, but to avoid having to step up onto the patio, excavate before starting the patio. To begin, mark the border location and dig a trench 12" wide and about 2" deep to serve as the foundation for the slate border. 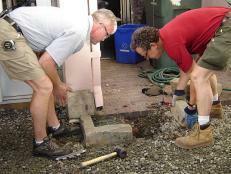 By digging the trench first – before excavating for the gravel – there's no need to build a form to shape the concrete. The soil does the job. Note: Use a heavy-duty rototiller to break up and remove harder soil, setting the soil aside to create a planting mound. 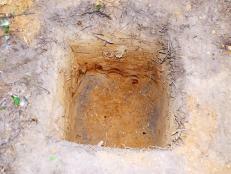 When the bulk of the soil is out, level out the surface with square shovels. If the area has poor drainage, add drainage pipe or pitch the soil to drain as desired. 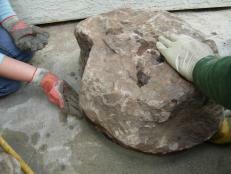 Decide the position for the different pieces of slate, picking the pieces that fit together best. 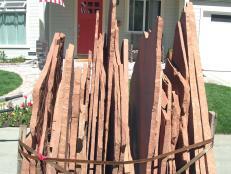 There is a wide variety of slate, we used mariposa. Before installing the slate, wash off the underside of the stone with a wet sponge so that it will stick to the cement more securely. 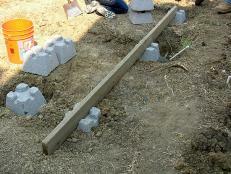 Mix and pour concrete into the trench. For large jobs like this one, it’s very convenient to rent a portable cement mixer. 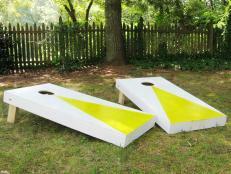 It's also possible – though more work – to mix the concrete either by hand or using a heavy-duty drill with a paddle bit. 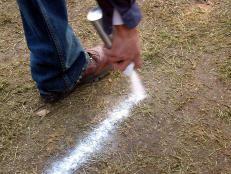 Fill the entire trench with cement, smoothing the surface with a trowel. 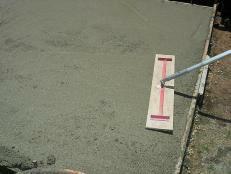 Let the cement set for a short time before placing the slate. 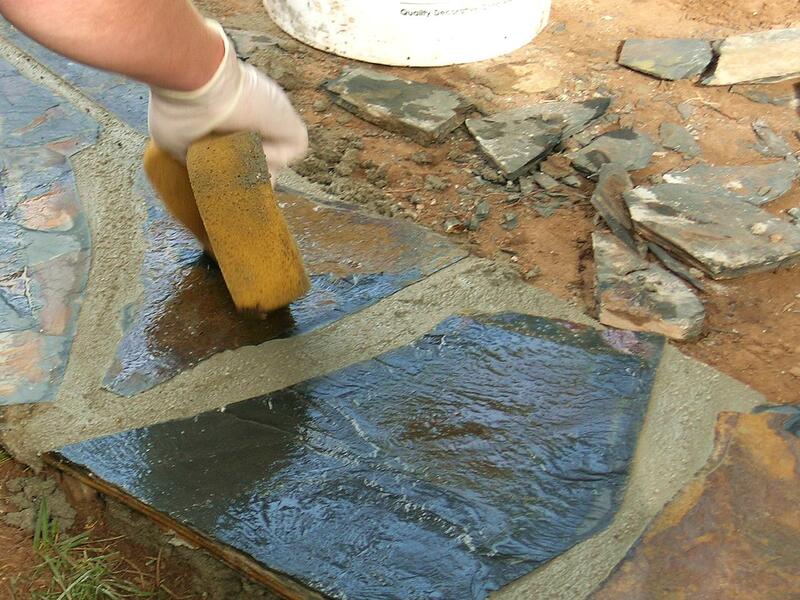 Press the cleaned slate into the wet cement, leaving even gaps of about 1" between the pieces. Wearing safety glasses and a dust mask, mix mortar according to the manufacturer's instructions until it’s the consistency of brownie batter. Use a trowel to scoop mortar into the gaps, then wipe with a wet sponge to spread the mortar in the gaps and clean away any excess. The mortar should sit flush with the top of the stones. 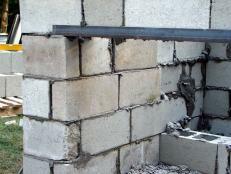 Allow the concrete and mortar to dry completely before moving on to the next step. With the concrete and mortar dry, excavate inside the border. Excavate at least 4" down from the top of the slate border, using square shovels to level off the bottom of the pit. 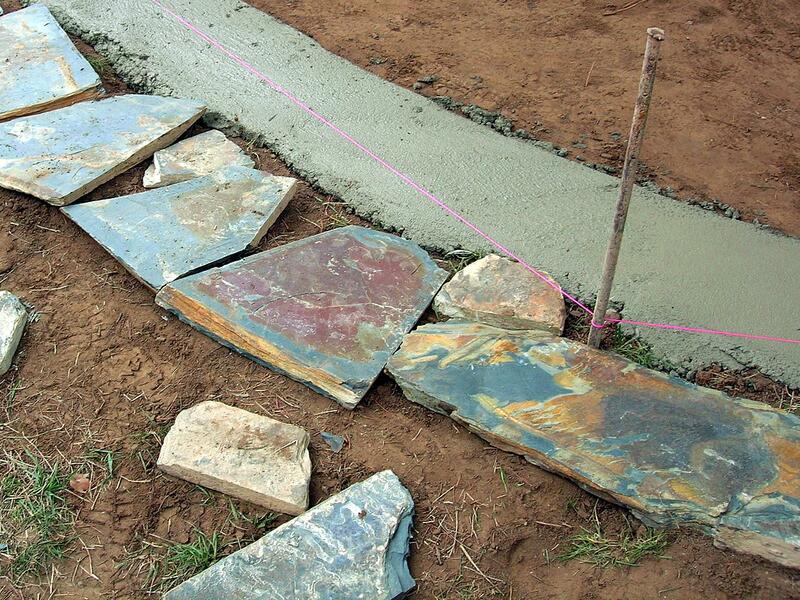 Road base, also known as base rock, will provide the foundation for the decorative gravel. 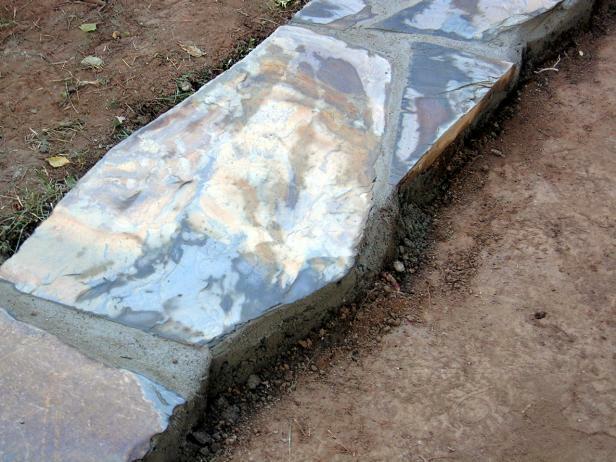 It is less expensive than decorative gravels and is made up of angular pieces that lock together when compacted. Spread fill the bowl formed by the border 3/4 of the way full of road base, spreading it evenly throughout the area. 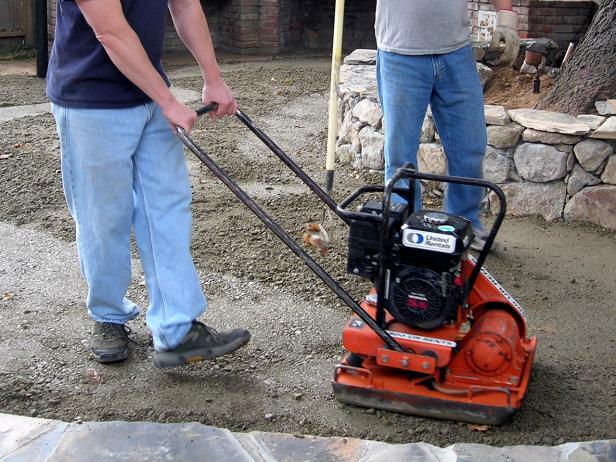 Use a plate compactor – available at tool-rental facilities – to tamp down the road base. 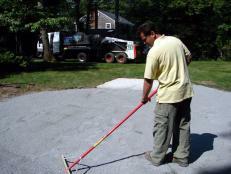 For this project, we used a 1/4" round pebble gravel in tans and grays. The rounded pebbles are more comfortable to walk on, especially for dogs. Spread the decorative gravel over the road base, then level it out with iron rakes. Don't use a plate compactor on this material: It won't compact like the road base, and pebbles could shoot out from under the machine. 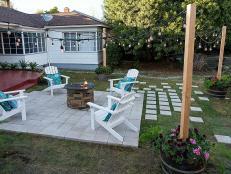 Create a family sitting area in your backyard by building a slate patio. 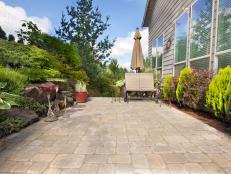 Add a touch of elegance to a backyard with this travertine tile patio. Not only is this new patio a great outdoor living area, it's an easy-to-install, compacted-rock project that doesn't use even a dribble of cement. 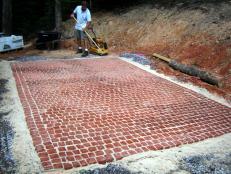 Learn how to create a lovely outdoor space by laying a new cobblestone patio. 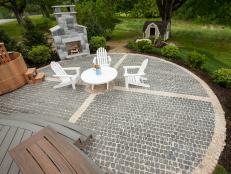 Enhance your exterior living space with a European-style cobblestone-clad patio. Give an old concrete patio a complete facelift with an overlay of pebbles mixed with epoxy. 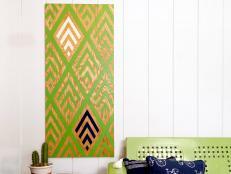 The result is a patio that looks like a sandy beach, giving the feel of an island resort in your own backyard. This natural-looking patio makes a perfect party place. An old concrete patio with a mismatched paver extension gets a completely different look with a stylish cobblestone overlay. 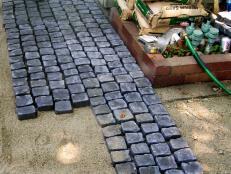 Using mats of pavers makes the installation fast and easy. A pizza oven provides a stunning focal point for a completed outdoor room.